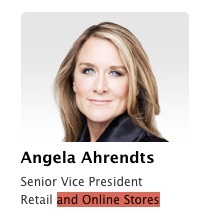 Apple updated its leadership page this weekend to reflect a minor change to Angela Ahrendts’ title, which has been simplified to “Senior Vice President, Retail” as “Online Stores” has been dropped. Ahrendts remains responsible for “strategy, real estate and development, and operations” of both Apple’s physical stores and online storefront, according to her slightly updated bio. Angela Ahrendts is Apple’s Senior Vice President of Retail, reporting to CEO Tim Cook. Angela is responsible for strategy, real estate & development, and operations of Apple’s physical stores, Apple’s online store and contact centers. Since joining Apple in 2014, Angela has integrated Apple’s physical and digital retail businesses to create a seamless customer experience for over a billion visitors per year with the goal of educating, inspiring, entertaining and enriching communities. Apple employees set the standard for customer service in stores and online, delivering support from highly trained Geniuses and expert advice from Creative Pros to help customers get the most out of their Apple products. The title change is likely in line with Apple’s simplified retail branding, including dropping the “Store” moniker when referring to its retail locations by name. Apple has also been attempting to converge its physical and online retail experiences over the past few years, and Ahrendts’ new title reflects those efforts.